Michael Gaughan, the eldest of six children, was born in Ballina, Co Mayo. After finishing his schooling, he left Ireland for England, in search of work. Whilst in England, he joined the IRA and became an active Volunteer in a London-based ASU. During a fundraising mission, he was captured and ultimately convicted of arms possession and conspiracy to rob 530 pounds from a London bank. He was initially sent to Wormwood Scrubs, where he spent two years before being transferred to Albany Prison. In Albany, Gaughan requested political status. Prison officials responded to his request by placing him in a solitary punishment cell. Eventually, he was transferred to Parkhurst prison where four of the Belfast Ten were on hunger strike for political status. 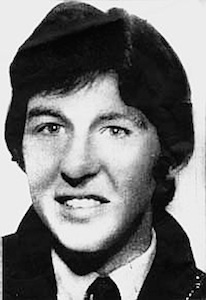 On March 31st, 1974, Michael Gaughan, along with Frank Stagg, Paul Holme, and Hugh Feeney, joined the strike. British policy at this time was to force feed hunger-strikers in a particularly brutal manner: Six to eight guards would restrain the prisoner and drag him or her by the hair to the top of the bed, where they would stretch the prisoner’s neck over the metal rail, force a block between his or her teeth and then pass a feeding tube, which extended down the throat, through a hole in the block. The process would leave the prisoner bruised and battered. And, even on an unconscious individual, it carried the additional danger of the tube passing mistakenly into the trachea and the lungs rather than into the esophagus and stomach. Michael Gaughan suffered this brutal procedure seventeen times in the course of his hunger strike. The last time was on 2 June, the night before his death. On 3rd June, 1974, he died from injuries suffered when food lodged in a lung punctured by a feeding tube. He had been on hunger strike 67 days. He was 24 years old.